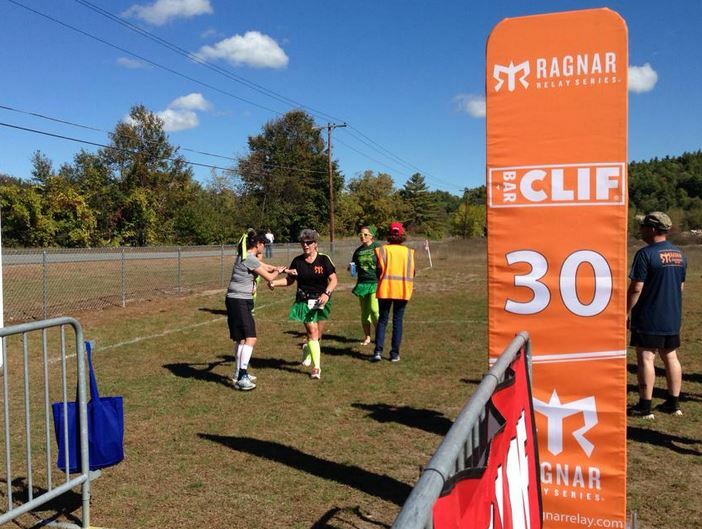 This is the fourth in a series of posts on my experience running the Ragnar Relay in the Adirondacks. After my hand-off of the slap bracelet to Meredith in Gavin Park, Van 1 decided to head off for food. We chose to stop at The Silo in Queensbury. I had banana walnut pancakes which were delicious. Others had breakfast sandwiches. The food was amazing. 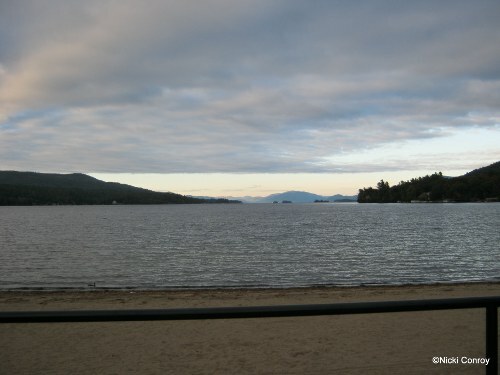 After breakfast, we headed north to Lake George. 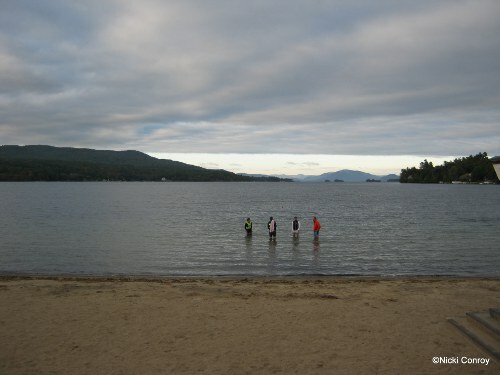 We were aiming for showers and sleep at the Wingate by Wyndham in Lake George. We split up, three in one room and four in the other. Maximum two hours of sleep would be gotten. Anyone who wanted to shower would get one. After getting fresh towels for van 2 from housekeeping, we were down reloading the van. Off to Million Dollar Beach. 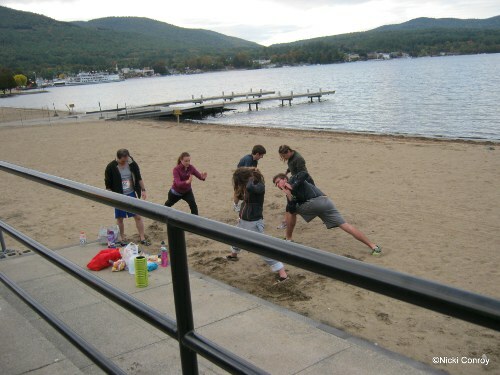 The second major exchange was at Million Dollar Beach along Lake George. Parking was limited as there were so many 15 passenger vans but we got a spot not too far from Van 2. And the wait begins for runner 12 to come in and put the slap bracelet on runner 1’s arm. Below are some of the shots from that wait time. Nikki – yes, there were two Nikkis in van 1 (though we spell our names differently) – headed out from Million Dollar Beach and we loaded into van 1 to cheer her on. We made a couple stops on her run and were waiting for her when Alex got a call from her saying she thought she was lost. The sun was setting and it was dark by this point. I am sure I would have been afraid that I was not on the right track. I saw no signs along my night run but more on that later. After Nikki was Stephanie. We were stopped waiting to cheer her on when she wanted to take off a layer of clothing. Good thing we were where we were. The next cheering stop for her we handed her The Stick as she has been recovering from an injury and her leg needed a bit of work. During this leg, we stopped at a convenience mart and used the bathrooms. We also all chipped in and bought a number of lottery tickets as the pot was up over 160 million dollars. Stephanie handed off the slap bracelet to Loretta. We stopped about half way through Loretta’s leg to cheer her on. With it being dark, it was essential we found a spot that got the van totally off the road. Jen was getting prepped for her leg – the hardest one of the race as it went up Tongue Mountain. Loretta slapped the bracelet on Jen and she was off. Now was the time for me to start getting nervous. Jen would finish and then Cheryl before I would head out into the night. At this point we were running along NYS Route 9N. Other than the interstate, this is a major north-south route. It is, though, only a two lane road. Good news is that it has lines for the shoulders but not much space in places. During Jen’s leg up Tongue Mountain, a woman turned her ankle and fell. Jen saw her at a water station (these may make you think that there are people but the water stations were, for the most part, unmanned). Waiting at the exchange, someone yelled a team number and then “we have your runner.” Never a good thing to hear. I got ready to run while Cheryl was out on Route 9N. I put my fuel belt on – 8.7 miles and unsupported. I made sure I had my bib on. I got my vest adjusted and my headlamp on. I pinned my taillight to the back of my headlamp. My guess – cell service was limited and mine was just not there at all – is the temps were about 40F. I wore long sleeves, capris and my Sparkle Athletic skirt. What I found is that running in the dark is not my thing. I have three settings on my headlamp for where it will shine. I put it on the middle one – angled sort of towards the road and sort of towards traffic. By mile 2 – I would guess – the fog was settling in and I was soaked with sweat and dampness. It would be a very uncomfortable almost 9 miles. While I had no other runners come up on me suddenly, it is spooky to be running alone and suddenly you can either see another light nearby or hear footsteps. Let me say tractor trailers coming barreling down the road towards you in the dark is really scary. And, while I run hills all the time, it was a cruel joke to put the end of the leg up a hill into Ticonderoga Middle School. In the dark – under beautiful stars, I slapped that bracelet on Meredith’s wrist for the second time. It was about quarter of one, Saturday morning. After this exchange, there were some decisions to make. We could sleep where we were. There were warm – although most were saying the warm water was gone – showers and a gym floor to sleep on. 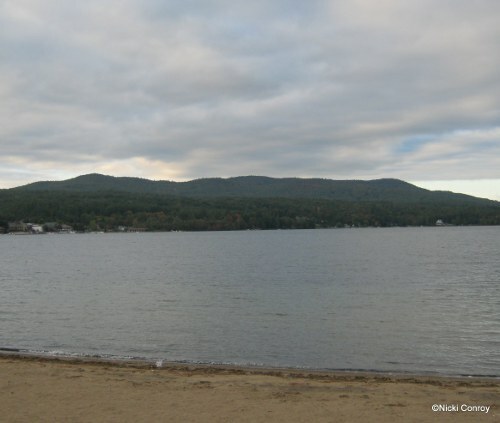 We could go back to the hotel in Lake George but this would cut down on our sleep time due to travel time. 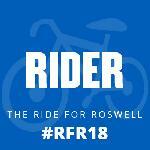 We could go forward to the Essex County Fairgrounds, sleep and eat there and await van 2. The final decision was to go forward, thinking we would get more sleep. Evidently, a lot of people thought the same way. The building to sleep in was fairly full. There were very few spots to set up a sleeping bag. I got about 45 minutes sleep before I decided I was just too cold to stay sleeping. I got up and changed into different clothing. I also got a cup of coffee and had a short discussion about Paul Smith’s College with a guy wearing a PSC sweatshirt. We are both alums. I did a second take at his sweatshirt when I heard him saying something about ambient light to someone remarking how amazing the stars were. As Keri came into the Essex County Fairgrounds, Nikki headed out. While still dark, the sky was starting to lighten up a bit. We cheered Nikki on at several stops along her leg. We also questioned Stephanie as to how often she wanted to see us on her upcoming leg. You could see the excitement as Nikki checked off that last leg on the side of the van. I have to admit that Stephanie’s, Loretta’s, Jen’s and Cheryl’s last legs were a blur to me. I remember we were worried as Stephanie had a leg injury and seemed to be taking long than we thought from where we had last seen her. We went to a Stewart’s after Loretta left the exchange – bathroom break, pick up breakfast, more water for the van. We almost missed seeing Loretta on the run at all. Jen’s leg seemed a bit short but that could be because it was a straight shot and not as long as her night leg. Cheryl’s leg was on a dirt road. Many times the RagMag warned vans to go slow so as to not kick up dirt. We tried our hardest and I do not recall seeing a lot of dirt but it seemed other vans went flying by us. I told the van not to worry about me. 8 miles is not a long run. I had my fuel belt and GU in it. I should be fine. By the time I took the slap bracelet from Cheryl, the road was paved again. I started off with heavy legs but they settled into a groove in no time. Things were looking good. Other vans were going past and honking and ringing cowbells out the windows. I was sure I had been right in telling the van to not stop for me. The van went past me and yelled and cheered. At about 4 miles, I got some more water from the van. At about 6 miles I could hardly breathe. I was in a full-blown asthma attack. I tried walking for a few seconds which helped but then I would think of the team and start up running again. Thankfully, Cheryl and Alex met me at some point around mile 6. They walked with me for a bit. I checked time, put more New Skin on, and gave them an estimate of when I was going to hit the exchange. Van 2 came by me at some point also. The problem being I was doing good breathing until I saw my teammates and then the attack would re-surface. I’m almost to the point where I want to say my asthma is not exercise-induced but emotionally induced. I kept going, walking when I needed a quick drink. The heat must have had race officials worried. I had three different official race vehicles pass me asking if I needed water. Many other team’s vans would also slow and ask runners if they needed anything. My original plan was not to open it up going downhill near the end of the leg. I did, though, let it go and run as fast as I could down those hills as I knew I was falling further and further behind. Come to find out – I ran across and gave Meredith that slap bracelet one last time a minute and a half earlier than I had said mid-run and somehow three minutes before we were scheduled on the pace calculator to be there. Lessons learned – a ton of them! But they are for a shorter post. Fun had – immeasurable! 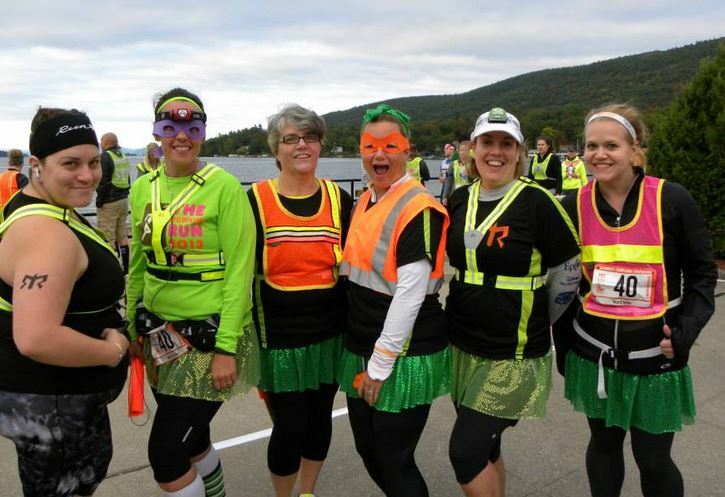 Thank you to the Turtles and everyone else out there running last weekend. I enjoyed following this journey with you guys on Facebook and Twitter. I can’t wait to do one myself one of these years!